Bakersfield, CA – MAVTV and Lucas Oil Productions will be on hand once again to nationally televise the upcoming “Winter Showdown” at Kern County Raceway Park in Bakersfield, California. The $180,000.00 Winter Showdown for Super Late Models/Tour Cars is one of the nation’s richest short-track events, with top drivers from throughout the nation already entered in the February 10th and 11th event. The two-day event will also feature the Lucas Oil Modified Series, which MAVTV will also televise. The Winter Showdown will air on a taped delayed basis, with the air dates of the “Winter Showdown 250” and the Lucas Oil Modified event to be announced at a later date. For more event information, go to the www.SRLSouthwestTour.com. MIDDLETON, IDAHO (January 10, 2017) – 12 year-old Zachary Telford of Middleton, ID has his sights set on a full season in the 51FIFTY Jr. Late Models at Madera Speedway in 2017. Telford has entered the Search for a Champion online sponsorship competition with hopes of attracting additional support for the upcoming season. Champion Spark Plugs is offering $125,000 in sponsorship including a $50,000 grand prize sponsorship. One aspect of the competition is a fan vote, with voting open until February 2nd. Fans can register online at http://sfac.championautoparts.com/ and vote once daily throughout the competition. Voters are also eligible for their own prizes with 200 prizes of various Champion Spark Plugs merchandise being offered. Plans are in motion for Telford to race in Jr. Late Models, Legends cars, and Karts in 2017. The young driver is spending his off season training in iRacing and getting ready for spring testing in the upcoming months. Sponsorship information is available by contacting James Telford at (208) 941-2116. Race fans can keep up on all of the action for Zach Telford Racing and Telford Motorsports by following each respective page on Facebook. www.ZachTelford.com is conveniently linked to the Zach Telford Racing Facebook page. Zach Telford Racing thanks Precision Framing, Inc, Mendiola Custom Homes, Penguin Powersports, Pathfinder Chassis, Hampton Inn - Madera, RFC Karts, Kevin Sharrah Designs, and Blakesley Sports Media for their support. The Lucas Oil owned MAV TV will be presenting some exciting, nationally televised, short track action this week featuring 2016 events prepared by the award winning Lucas Oil Production Studios. 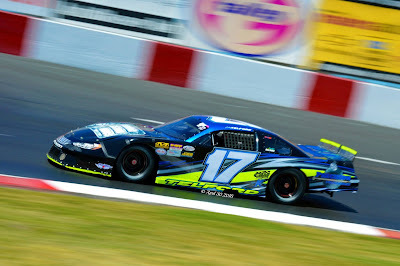 The Lucas Oil Modified Racing Series, presented by Loan Mart, will be featured twice this week from the Loan Madera Speedway and the Las Vegas Motor Speedway's Bullring. The race at Loan Mart Madera, the fastest one third mile in the west, was video taped back on June 11th and features the typical action seen anytime the Modified teams takes the green flag there. The broadcast times are: Tuesday, January 10th, 3 pm eastern time and 12 pm pacific. Also of interest to fans of the Loan Mart Madera Speedway will be MAV TV's presentation of the 51 FIFTY Junior Late Model Series featuring teen drivers in a racing division designed to create the next level of late model racing at Madera. This program can be seen on Thursday, January 12th, at 8 pm eastern and 5 pm pacific. A replay is scheduled for the same night at 11 pm ET and 8 pm pacific. The Lucas Oil Modifieds will be returning to MAV TV's airwaves on Friday, January 13th, from the Las Vegas Motor Speedway's Bullring which was video taped back on May 21st. The Modified Series absolutely shines at this track, a high banked, super fast facility that has been producing high quality shows for decades. Broadcast times for the Las Vegas event are: Friday, January 13th, 1 am eastern. Fans residing on the west coast can see this race on Thursday, January 12th, at 10 pm. Tell your family, friends and especially your sponsors that your racing team is going to be featured on national television.